Now, an affordable entry-level GPS guidance and recording system. Start from here and grow to there. LIGHTWEIGHT & COMPACT – Entire system weighs less than 7 lbs/3 kilograms. MODULAR – Add components & functionality to meet your growing needs. FULL FEATURED – Includes all the unique navigational features of our professional system. EXPANDABLE – Fully upgradable to include all of the features of our professional system. EASY TO INSTALL – Complete system has an Integrated Flight Guidance Instrument (IFGI), a DynaGrip Control, pre -wired harness, antenna, and interface box. EASY TO USE – Entire system is controlled by 2 switches (Tophat and Trigger) on the DynaGrip. Other switches are for normal aircraft functions. IFGI – The Integrated Flight Guidance Instrument is heads-up dash mounted to be cleary visible while the pilot is looking outside the cockpit. A GPS/GLONASS based guidance and mapping system that provides precise navigation and recording of the application of seeds, fertilizers and chemicals to any treatment area – regardless of size or shape. 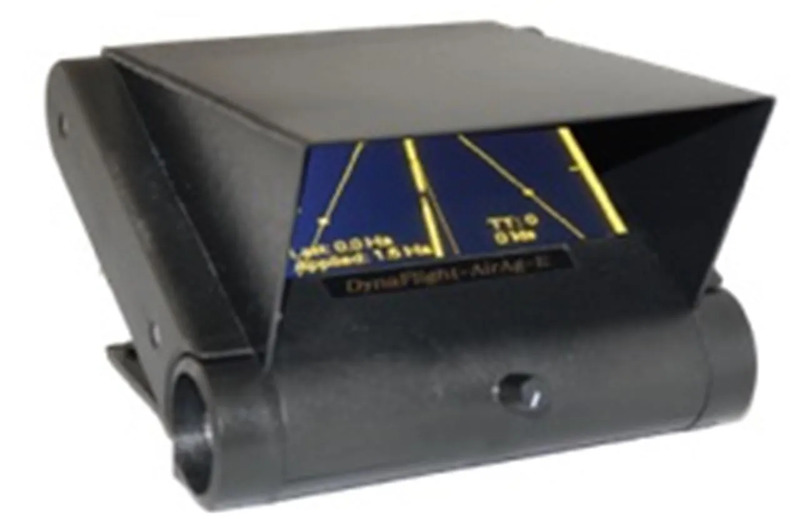 The DynaFlight-AirAg-E™ system uses our unique FlexGuide™ to simply point the way to a complete and accurate coverage in its’ IFGI (Integrated Flight Guidance Instrument) “heads-up” display. Featuring a unique, simple to use interface and new pilot tools, the DynaFlight-AirAg-E™ provides highly efficient aerial applications for improved productivity (more acres per hour). With the Upload/Download option, the DynaNav AirAg Office management software has simple tools for managing and reporting for all types of aerial application operations, including forestry applications and import/export of Shape Files and Google Earth KML files. • Dash-top mounted IFGI™ Display provides the pilot with a safe "in view" guidance and operation. • FreeForm RoadWay guidance display to automatically spray any pattern. • DynaFlight-AirAgII™ maintains a permanent flight record of all applications for the complete season. • IFGI display has “heads-up” Job Review Map. • “Heads-up” Live Map for application of headlands, clean-up and Forestry operations. • Unlimited number of Customers, Jobs, Patterns, Nav points, Unfinished jobs, Polygons, etc. • DynaGrip™ control, cyclic or collective grip, for pilots’ instant control of the entire DynaFlight system. • Unique simple to use pilot interface giving the pilot full and easy usage of any feature required. • Full simulation of Air and Office systems FREE!! Free software upgrades with 3 year ServicePak. • Windows based software with all manuals and AirAg Simulator for training. guidance and operating buttons, for heads up safe operations. • Rugged DynaGrip™ Control grip for safe and intuitive operator input. Installation kit including antenna and DynaGrip™ 4.4 lbs. (2kg) Please note: Specifications subject to change without notice.